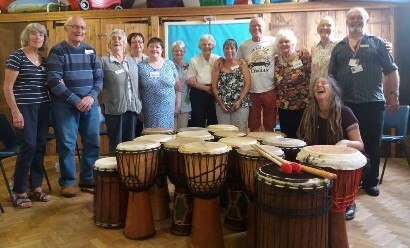 I provide djembe drumming workshops for many projects, services and groups that work with adults, children and families in and around the Derbyshire Staffordshire and Leicestershire areas. I have facilitated workshops within Adult Mental Health, Child & Adolescent Mental Health, Education Settings, Dementia Services, adults and children with learning disabilities, Arts/Performing Arts Projects, Youth Services, Carers Projects, Home Education groups, Scouts Brownies and Guides, School holiday clubs and various other community groups. Everyone is encouraged to contribute regardless of age or ability, creating a fun entry level learning experience. 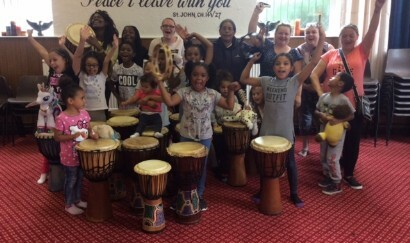 There are up to 30 drums of various sizes available for participants to use, as well as small percussion instruments for those that wish to shake and tap instead! A workshop typically lasts for 1 hour, however it can be shorter or longer depending on the groups needs. If you would like a drum workshop for your project, service or group, please contact me via the contact page. Sessions can either be one-off or a series of workshops, and are tailor-made to suit your requirements, which are discussed upon enquiry. I have a current DBS check and Public Liability.